Who should read this? Anyone who takes the preaching ministry seriously, especially for these ritual moments. Why does it matter? These ritual events are key to the lives of most Christians, deserving the best we can give. What will you like the most? The links all three writers offer between the Scriptures and the ritual events, prayer texts, and congregations. What will get you thinking? The refusal of each author to settle for “canned” homilies, insisting on the seriousness and value of preaching in general and preaching at these events in particular. Challenging. People expecting to find this book an easy read are in for disappointment. 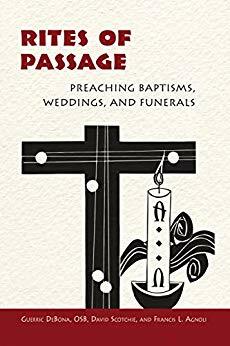 This is a well-crafted presentation of the preaching ministry that requires at least a basic understanding of contemporary liturgical theology and a willingness to spend time on preparation for preaching at children’s baptisms as well as weddings and funerals. Taking the premise of this book seriously requires a commitment of time and energy that may be hard to find for many preachers. Challenge. While each of the authors is careful to emphasize the shifting contexts for preaching and shifting expectations among congregants, I believe that the situation may be worse than they describe. It is my experience that many people who participate in such ritual events do so for the sake of the family and not because they expect to hear a challenging or lifesaving word from the preacher. On other words, many participants are not there to share in a religious event but in a cultural remnant hanging on in a post-Christian world. They expect that the preacher will say nothing important but merely blather empty banalities. The challenge to allow the Word to speak, in other words, is far more serious than these authors will admit. It goes far beyond the already challenging task of serving people who are “sometimes fragmented, often confused, searching for the God who already seeks them” (page xvii). Gordon E. Truitt has served liturgical renewal at the parish, diocesan, and national levels, including 30 years as the publications editor for the National Association of Pastoral Musicians. He holds a doctorate in sacred theology from The Catholic University of America, Washington, DC. Married to Carole Truitt for 34 years, he is now retired from his work at NPM.